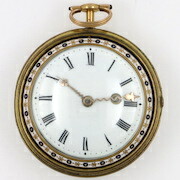 To browse our antique pocket watches, select one of the links above. 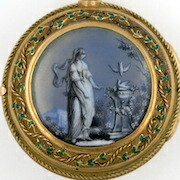 Then click on the image of a watch to see full details and a set of images. Our lists of antique pocket watches for sale are constantly being updated, highlighting watches recently added, so please keep checking for updates. These are just some of the new watches that have recently been added. 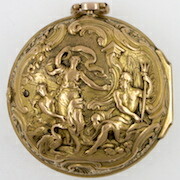 To buy an antique pocket watch or send an enquiry, please click here to contact us. We specialise in the sale of early English and Continental watches, mainly from the 18th century and early 19th century, and always try to offer a variety of interesting watches. 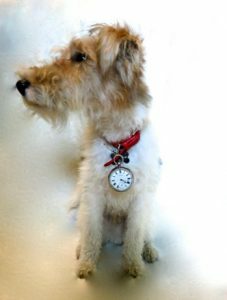 These include antique pocket watches with verge, cylinder and duplex movements, and usually some vintage watches with early lever or rack lever movements. Complications such as repeaters, alarms and clockwatches are often featured. We always have some pocket watches with interesting cases, including gold and silver repousse, triple cases, pair cases, hunter cases, half hunters, enamel cases, and anything unusual or ornamental. 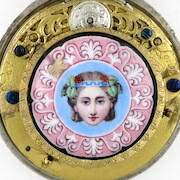 The watches for sale include examples with interesting dials, such as gold and silver champleve, polychrome and calendars. 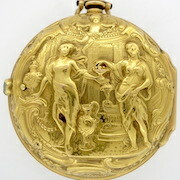 Our Workshop page includes watch cases, movements, watch chains, chatelaines and other items of horological interest.